You know a recipe is good, when it takes a food that you normally wouldn’t like, and makes it the best thing you have ever eaten. Take for example, apple chutney. Honestly, chutney doesn’t do it for me. I would rather eat something plain than slather what I consider to be a poor-man’s relish on it. Then I ate at Blacksmith in downtown Bend. The idea of a fine dining experience, in Central Oregon after a day of exploring caves, taking nature hikes, mountain biking trails or kayaking one of the many lakes in the area, might seem a little out of place, but don’t worry, a sport coat here should be made out of GORE-TEX. And if you are expecting dainty, bite-sized entrées, then you have come to the wrong place. Executive chef Gavin McMichael has created a menu that will put the exclamation point on any active day in the Bend area. Staples of the menu include “Not Your Mother’s Meatloaf,” “Campfire trout” and my personal favorite, “Rancher’s Ribeye.” McMichael also has other dishes that put a new spin on comfort food, including a cider brined pork chop and cheesesteak. The restaurant, located in a historic blacksmith workshop built in 1923 and used until the 1970s, has a rustic but modern feel with the brick and stone walls exposed and accented with earth tones and black trim, making it feel very warm and welcoming. The table layout also allows you to have almost a private dining experience. Add in a wait staff that is willing to help non-foodies know the proper pairings of food and wine, suggest new things and even help you figure out which way to eat something, and it’s an excellent recipe for a restaurant that has been around for 10 years near Bend’s core. While the food, from the appetizers to even the hand-made sodas and desserts, are something that have been written about everywhere from Sunset Magazine to the National Geographic Traveler, Blacksmith is more than just a great place to enjoy a very good dinner. That’s why it’s important to make a reservation if you want to get a table, especially during the summer months from June through September. “The bulk of our business is around summer,” Hardy said. “We have a very versatile menu, you can do everything from a six-course tasting menu to a steak dinner. It’s also a lounge and nightclub. Starting at 10 p.m. on Friday and Saturday nights, Blacksmith After Dark takes the restaurant and turns it into a night spot featuring live music, dancing and a unique-looking bar. Made of recycled milk containers and backlit, the bar area greets you when you walk into Blacksmith and is a very cool welcome to a great hot spot. 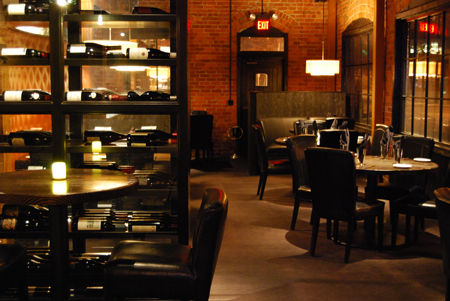 The “Anvil” room, which normally has a few tables and chairs during dinner service, is cleared to make a dance floor, and there are a number of couches and comfortable chairs in the front of the building that make the lounge match the welcoming atmosphere of the restaurant. But make no mistake, Blacksmith is about food, and the way McMichael brings local, fresh ingredients to celebrate not only Central Oregon, but Bend, makes Blacksmith a must visit. What to bring: This isn’t your dainty fine dining portions, bring your appetite and give yourself plenty of time to enjoy a carnival for your taste buds. Also be advised that this is very good, local, fresh food, and as such it comes with prices that match. This isn’t a chain restaurant, but it is worth every penny. Tip: Make a reservation and don’t be afraid to try new things. I am not a fan of fried green tomatoes, yet, the ones I had at Blacksmith were not just the best fried green tomatoes I have had, but one of the best dishes I have had. Leave your prejudices at the door. Season: The restaurant is open year round, however it is busy during the summer months. Getting there: The address of the restaurant is 211 NW Greenwood Avenue in Bend. It’s near downtown Bend and very easy to find.